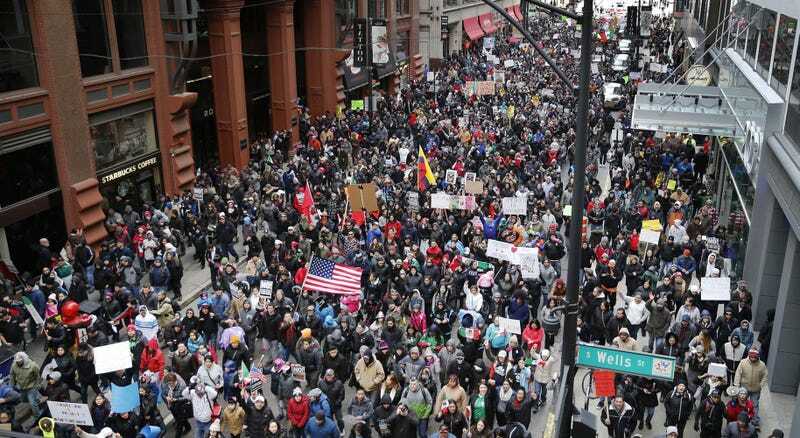 Protesters participate in a march aimed against President Donald Trump’s efforts to crack down on immigration on Feb. 16, 2017, in Chicago. Charles Rex Arbogast / APMore than 100 protesters across the country were fired from their jobs after skipping work to take part in last week’s “Day Without Immigrants” demonstration. Restaurants and day cares were among the businesses in states like Florida, Tennessee, Oklahoma and New York where bosses fired workers after they didn’t show up for work in order to protest. In Nolensville, Tennessee, nearly 20 employees at Bradley Coatings, Incorporated — a commercial painting company — were laid off after participating in the nationwide strike on Thursday, NBC4 reported.